Karyn Pugliese has 20 years experience in communications, broadcast news and documentaries. She has been honoured with by the Academy of Canadian Cinema and Television with the Gordon Sinclair Award for Broadcast Journalism (2017) and received 3 Native American Journalism Awards. 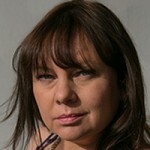 Her work has been nominated twice for Canadian Screen Awards and once for a CAB Gold Ribbon Award. Pugliese is best known for her work as Executive Director of News and current Affairs at the Aboriginal Peoples Television Network. APTN launched in 1999 as the first national Indigenous broadcaster in the world and currently serves 11 million Canadian subscribers. She is also the president of the Canadian Association of Journalists.